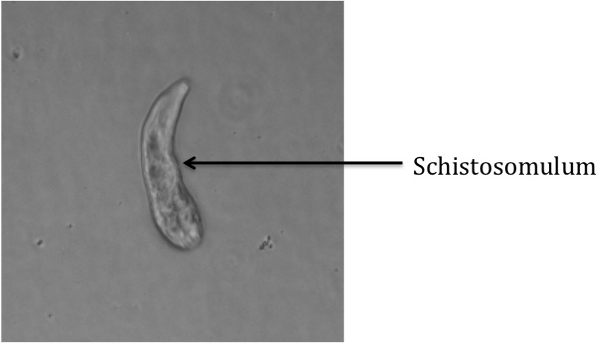 We describe an in vitro method for culturing schistosomula of the flatworm parasite Schistosoma mansoni, via the harvesting and transformation of infective cercariae from the fresh water snail intermediate host Biomphalaria glabrata. Milligan, J. N., Jolly, E. R. Cercarial Transformation and in vitro Cultivation of Schistosoma mansoni Schistosomules. J. Vis. Exp. (54), e3191, doi:10.3791/3191 (2011). Schistosome parasites are the causative agents of schistosomiasis, a chronically debilitating disease that affects over 200 million people globally and ranks second to malaria among parasitic diseases in terms of public health and socio-economic impact (1-4). Schistosome parasites are trematode worms with a complex life cycle interchanging between a parasitic life in molluscan and mammalian hosts with intervening free-swimming stages. Briefly, free-swimming cercariae infect a mammalian host by penetrating the skin with the aid of secreted proteases, during which time the cercariae lose their tails, transforming into schistosomules. The schistosomules must now evade the host immune system, develop a gut for digestion of red blood cells, and migrate though the lungs and portal circulation en route to their final destination in the hepatic portal system and eventually the mesenteric veins (for S. mansoni) where male and female worms pair and mate, producing hundreds of eggs daily. Some of the eggs are excreted from the body into fresh water, where the eggs hatch into free-swimming miracidia (5-10). The miracidia infect specific snail species and transform into mother and daughter sporocysts, which in turn, produce infective cercariae, completing the life cycle. 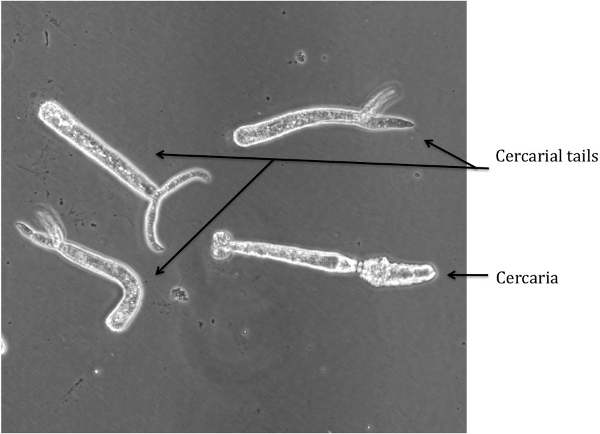 Unfortunately, the entire schistosome life cycle cannot be cultured in vitro, but infective cercariae can be transformed into schistosomules, and the schistosomules can be cultured for weeks for the analysis of schistosome development in vitro or microarray analysis. In this protocol, we provide a visual description of cercarial transformation and in vitro culturing of schistosomules. We shed infectious cercariae from the snail host Biomphalaria glabrata and manually transform them into schistosomules by detaching their tails using an emulsifying double-ended needle. The in vitro cercarial transformation and schistosomules culture techniques described avoid the use of a mammalian host, which simplifies visualization of schistosomes and facilitates the collection of the parasite for experimental analysis. in vitro transformation and culturing techniques of schistosomes have been done for years (11, 12), but no visual protocols have been developed that are available to the entire community. Schistosome cercariae can directly penetrate the skin without the needs of a cut or pores, and cause the chronic disease schistosomiasis. S. mansoni is a biosafety level 2 organism, therefore proper personal protective equipment and proper safety measures must be followed when working with infective cercaria. Most of the equipment necessary to grow and transform schistosomes is standard, with a few key exceptions noted in the table at the end of the protocol. All cercarial work should be done in an isolated room. Schistosomules should be cultured in a sterile, approved biosafety hood. Two layers of nitrile or latex gloves should be worn, as should a lab coat, a waterproof pair of shoes, pants with no holes or tears, and waterproof sleeve protectors for your wrists and arms. In case of an accidental spill, immediately spray contaminated area with 70% ethanol or 10% bleach, rubbing vigorously if on your person. This will be sufficient to disable the parasite, but all possible infections should be reported and taken seriously. Although schistosomules are not innately infective, institutional guidelines vary, and should be consulted to determine whether BSL2 precautions are required during noninfectious life stages. Disinfect all surfaces that come into contact with any potentially infectious substance after the experiment is performed and discard waste in an approved biohazard container. Fill a clean, 500mL beaker free of detergents halfway full with distilled water equilibrated to room temperature. If working with host snails infected with miracidia on different dates, use a separate beaker for each infection date (This is particularly important if the snails will be reused for future experiments). The size of the beaker can also be smaller depending on the experience of the user. Collect infected snail hosts you wish to shed and carefully deposit them in the beaker using a standard aquarium fish net and general purpose forceps as needed. Place beaker on an emergency spill tray approximately 8 to 12 inches beneath an incandescent light source. Let stand for 1-2 hours under the light. Cercariae exit the snail host when exposed to bright light. Carefully filter out snails from the cercariae mixture. Take extra safety precautions, as mixture is highly infectious. Remember, cercariae can directly penetrate human skin! Replace mixture under light source for about 15 minutes, allowing any particulate waste matter to settle. Transfer cercariae into a clean Erlenmeyer flask using a pipet, avoiding the debris at the bottom of the beaker. Place the flask at approximately a 45° angle on ice in the dark for 45 - 60 minutes, allowing cercariae to settle into one corner. Use a 50 mL pipet to remove 75 to 90% of the supernatant and deposit it in beaker containing 10% bleach or 70% ethanol, taking care not to let water drops containing cercariae drip from the pipet. Swirl the Erlenmeyer flask containing cercariae gently to resuspend the cercariae in solution. Use a pipet to transfer the sample to sterile 50 ml conical tubes. Place tubes again on ice for 20 minutes in the dark. Cercariae will settle towards the bottom of the tube in the dark. Before you begin: Make RPMI 1640 complete (RPMI, 5% Fetal Bovine Serum, 1X Pen/Strep) and warm to 37°C. (It is crucial that the fetal bovine serum used has been inactivated by incubation a 56°C for 1 hour as schistosomes can be sensitive to complement). In a biohazard hood, remove supernatant down to 5 to 10 ml of solution in each 50 ml conical using a pipettor or vacuum device. Attach a 22 gauge double-ended, luer lok emulsifying needle to an appropriately sized syringe. Slowly draw mixture into the syringe. Collect cercariae from all 50 ml tubes in a syringe. Be attentive of dripping. Carefully turn syringe over such that the unattached needle end is up. Attach another syringe to this side of the emulsifying needle. Pass the mixture through the needle a total of 40 times (20 times back and forth) to transform the cercariae. Position the syringes vertically such that the mixture is contained in the bottom syringe and the top syringe is empty. Remove top syringe and disinfect in 70% Ethanol. Deposit mixture drop by drop into a clean high walled 100mm x 50mm pyrex dish or crystallizing dish. Disinfect needle and syringe in 70% Ethanol. Add 37°C RPMI 1640 complete media such that the bottom of the Petri dish is completely covered, as if pouring a Luria broth plate. Swirl gently to collect schistosomules in the center of the Petri dish. Avoid splashing. Note: It may be useful to turn off the hood light for this step to more adequately visualize the schistosomules in the center. Immediately deposit concentrated schistosomules into a fresh 12-well cell culture plate well using a sterile dropper. Repeat 2.9 and 2.10 until schistosomules are no longer present in the center of the dish (approximately 10 times). Deposit each subsequent collection in a fresh well. Fill each well up halfway (˜1.5 mL ) with prewarmed RPMI complete media. Visualize on an inverted microscope to verify presence of schistosomules and absence of cercariae. Grow the schistosomules in a CO2 incubator set to 37°C and 5% CO2. Pending transfer of transformed schistosomules into culture media, visualization under an inverted bright-field microscope (See equipment table for an example) should yield an image similar to Figure 1, in which only transformed schistosomules are present in the well. Potential contaminants could include intact cercariae, severed cercarial tails, or other debris. If no inverted microscope is available, a standard microscope or even a dissection scope will be sufficient to visualize the schistosomules. Note that this procedure does not always transform 100% of cercariae. Several potential problems could arise during the transformation procedure; however, this protocol is designed to avoid most of these problems. One potential hazard is the clogging of the emulsifying needle, which usually arises due to debris left over from the harvesting in step 1.3. Be sure to allow all particulate matter to settle in step 1.5 and to transfer the cercariae carefully in step 1.6 to avoid this problem. Also, as described before, working inside a biological safety cabinet, use of personal protective equipment (even face shields) and avoidance of excessive pressure on the syringes is advisable. Detached cercarial tails can be visualized in the media, which is indicative of poor separation during step 2.9. The tails exhibit a spasm-like motion and have a distinct shape (see Figure 2), and thusly are easily distinguishable from the schistosomules. The tails can be removed by washing the schistosomules in excess of RPMI complete allowing the schistosomules to settle. The tails will remain floating and can be vacuumed off. If intact cercariae are present in the media, the transformation in step 2.5 was not executed properly. An image of an intact cercaria is depicted in Figure 3b for reference. If this problem occurs, insure that the emulsifying needle being used is of the proper size. Also, the number of times the cercarial mixture is passed through the needle can be increased, although 40 times is typically much more than enough to approach 100% shearing of the cercarial tails. Transformation of cercaria into schistosomules was first described in 1974 by Colley and Wikel (13). Since then, preparation of schistosomules has been done using either the shearing strategy with a needle and syringe as described in this protocol, or using a vortexing approach and separated with gradients of percoll (14, 15) or swirling as demonstrated in this paper. These two techniques for preparing schistosomules are beautifully described by Fred Lewis (16) and more information for further culturing of schistosomules for long-term growth can be found at the NIAID Schistosome Resource Center (www.schisto-resource.org). This project was funded by Case Western Reserve University startup funds provided to E. Jolly. Infected snails were provided by the Schistosome Resource Center, NIH-NIAID (NIAID Contract No. HHSN272201000009I). We also thank Chris King and Ronald Blanton for support in securing infected schistosome snails and for helpful discussions. Ross, A. G., Bartley, P. B., Sleigh, A. C., Olds, G. R., Li, Y., Williams, G. M. Schistosomiasis. N Engl J Med. 346, 1212-1220 (2002). Steinmann, P., Keiser, J., Bos, R., Tanner, M., Utzinger, J. Schistosomiasis and water resources development: systematic review, meta-analysis, and estimates of people at risk. Lancet Infect Dis. 6, 411-425 (2006). Savioli, L., Albonico, M., Engels, D., Montresor, A. Progress in the prevention and control of schistosomiasis and soil-transmitted helminthiasis. Parasitol Int. 53, 103-113 (2004). King, C. H., Dickman, K., Tisch, D. J. Reassessment of the cost of chronic helmintic infection: a meta-analysis of disability-related outcomes in endemic schistosomiasis. Lancet. 365, 1561-159 (2005). Haas, W., Grabe, K., Geis, C., Pach, T., Stoll, K., Fuchs, M. Recognition and invasion of human skin by Schistosoma mansoni cercariae: the key-role of L-arginine. Parasitology. 124, 153-167 (2002). Grabe, K., Haas, W. Navigation within host tissues: cercariae orientate towards dark after penetration. Parasitol Res. 93, 111-113 (2004). Shiff, C. J., Cmelik, S. H., Ley, H. E., Kriel, R. L. The influence of human skin lipids on the cercarial penetration responses of Schistosoma haematobium and Schistosoma mansoni. J Parasitol. 58, 476-480 (1972). Saladin, K. S. Schistosoma mansoni: cercarial responses to irradiance changes. J Parasitol. 68, 120-124 (1982). Chai, M., McManus, D. P., McInnes, R., Moertel, L., Tran, M., Loukas, A. Transcriptome profiling of lung schistosomula, in vitro cultured schistosomula and adult Schistosoma japonicum. Cell Mol Life Sci. 63, 919-929 (2006). Gobert, G. N., Tran, M. H., Moertel, L., Mulvenna, J., Jones, M. K., McManus, D. P. Transcriptional changes in Schistosoma mansoni during early schistosomula development and in the presence of erythrocytes. PLoS Negl Trop Dis. 4, (2011). Basch, P. F. Cultivation of Schistosoma mansoni in vitro. I. Establishment of cultures from cercariae and development until pairing. J Parasitol. 67, 179-185 (1981). Yoshino, T. P. &, Laursen, J. R. Production of Schistosoma mansoni daughter sporocysts from mother sporocysts maintained in synxenic culture with Biomphalaria glabrata embryonic (Bge) cells. J Parasitol. 81, 714-722 (1995). Colley, D. G., Wikel, S. K. Schistosoma mansoni: simplified method for the production of schistosomules. Exp Parasitol. 35, 44-51 (1974). Lazdins, J. K., Stein, M. J., David, J. R., Sher, A. Schistosoma mansoni: rapid isolation and purification of schistosomula of different developmental stages by centrifugation on discontinuous density gradients of Percoll. Exp Parasitol. 53, 39-44 (1982). Cousin, C. E., Stirewalt, M. A., Dorsey, C. H. Schistosoma mansoni: ultrastructure of early transformation of skin- and shear-pressure-derived schistosomules. Exp Parasitol. 51, 341-365 (1981). Lewis, F. Schistosomiasis. Curr Protoc Immunol. Chapter 19, 1-1 (2001). Thank you for share your experience with the cultivation of S. mansoni. It is surely a very good source for experimental development. I would like to hear from you how the worms manage the culture, speciallyif they grow up to the adult forms and are able to reproduce.